The Mississippian Indian culture is considered to be the highest prehistoric civilization in Georgia, since it is the most modern of the four prehistoric civilizations. The Mississippian culture period comes after the Woodland Indian culture. The Mississippian Indians were horticulturalists. They grew much of their food in small gardens using simple tools like stone axes, digging sticks, and fire. 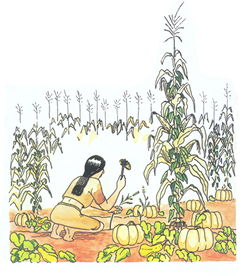 Much of their culture depended on the cultivation of corn, beans, squash, and pumpkins. 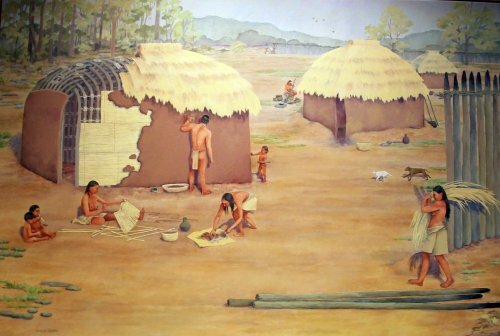 This shows that the Mississippian Indians were the most advanced farmers out of all of the prehistoric civilizations of Georgia. Since, they were so dependent on farming, Mississippian Indians were also the least nomadic cultural group. Of course, they were also hunter-gatherers, since they gathered nuts, fruits, and berries from the forest and still hunted small game. The Mississippian Indians created a complex social structure. Due to the social system that was created, Mississippian people were organized by ranked societies. In these ranked societies, social ranking put you in one of two groups, elites or commoners. Elites made up a relatively small percentage of the population, but had a higher social standing than commoners. In the Mississippian cultural period, your place in society was not controlled by wealth or even military power, but ideology. People who were believed to have supernatural connections to the gods were proclaimed elites, and enjoyed a life of special treatment. Elites had the largest houses, special clothes and food, and were exempt from the hard labor. The commoners were the every-day producers of society and were the ones doing the hard, manual labor. During the Mississippian Indian cultural period, villages grew to sizes that were unimaginable in past cultural periods. Some settlements were even home to several thousand families. The typical village consisted of three main parts: the central plaza, a residential zone, and defensive structures. The plaza was in the center of town, and served as a gathering place for many social and religious events. Homes were built around the plaza, and often had small courtyards. 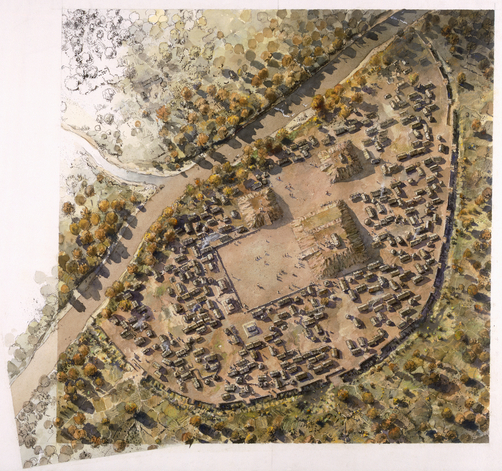 Not all Mississippian villages had defensive structures, but the ones that did usually had palisades surrounding the village. Defensive structures were used because there was a lot of warfare between tribes during the Mississippian cultural period. War was so common, that large alliances and even confederacies were formed. Pictured above is an aerial view of what a Mississippian village would most likely look like. Certain Mississippian towns featured mounds. They were made from packing soil and could stand up to a 100 feet tall. Since they were so large, and packing soil without modern-day machines is grueling work, it could take more than a 100 years to complete a mound. When the mounds were completed, they had a couple possible uses: a platform for another building, a cemetery, or a stage for religious activities. Mississippian towns that contained more than one mound served as capitals. Coincidentally, mounds are directly combined with Mississippian chiefs, because only a Mississippian chief could build a temple or building on a mound.